Monday, Monday--so good to me. Okay--maybe not really, but I am trying to be positive. Woke up to snow and boy is it slick out, so I am sticking close to home--doing laundry and puttering around. While dusting, I decided I'd share with you a few pictures of "treasures" from garage sales and thrift stores that I use in my home. I think you can click on any of the pictures to see a larger image. 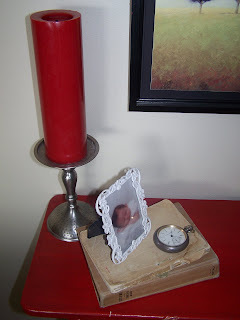 This is a candlestick I got for $.75, an old pocket watch and a picture frame atop a few old books. The top one is a book a poetry--a different poem for each day. It is missing its cover and is tied together with a bit of green floss. I put this lamp on a silverplate tray to add more presence to it. I added the little glass beads around the bottom for extra shine. Here is a picture of the whole table. the table was an 80's purchase from a craft show. 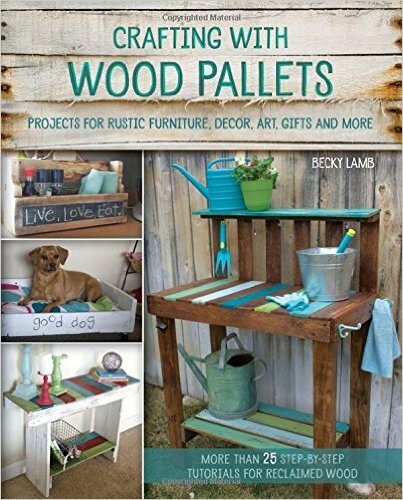 I had it stained in the natural pine color for a long time and then didn't use it for a while. It's amazing what a little paint can do. I have so many people who want that table. 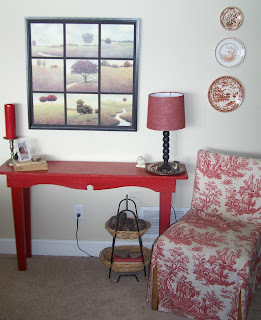 The red toile chair is an old oak chair that I bought from the University of Montana for $2.50. It has arms that I took off (and saved for the future). I made the slipcover. I'm not sure how much longer I will keep the toile--I have had it for about 5 years and i am getting tired of it. My three brown transferware plates I got at a thrift store--3 for $10. In the bottom basket there are some books that and two heart shaped rocks that my daughter found for me. 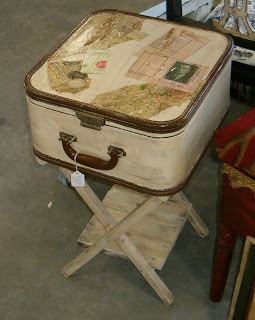 On top of my TV armoire is a battered suitcase or box with a tag that says 1950's snapshots on it. I keep old magazines in the case. 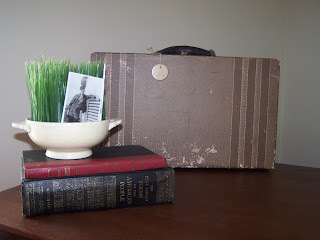 The bowl has fake grass in it and a picture of my dad from the Navy, during the Korean War. I use books a lot for added height and color. Nothing new here, I know. 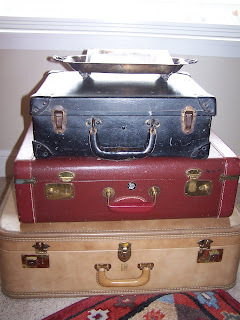 The key when looking for suitcases to stack is to have square ones that sit flat, and aren't slanted so you can sit things on top. 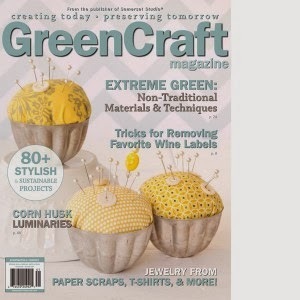 I store my decorating books and magazines in these. On top I have a silverplate relish tray with photos in it. People enjoy looking at the pictures and I trade them out every now and then. Have a great Monday, Monday! Happy Friday! I just returned from my antique booth. It's been kind of a slow month. I am hoping for a good weekend to boost my monthly sales. I start to question my prices, my "creations", etc. when it is a bad month. I think my stuff is reasonably priced and I get compliments on it. I think I will just blame it on the bad economy Ü! I had my camera sitting out to bring to take pictures and then left it here at home. I will take some next time I am out there. I did hit the one and only garage sale listed in the paper today. Bought four books for $1, but that is all. 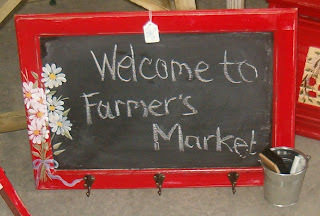 I think hubby and I will go to a few tomorrow morning, if it is not too cold. It was 16 degrees this morning! 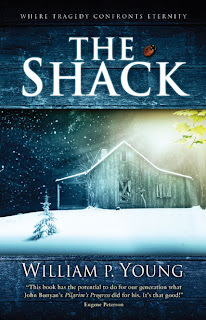 I wanted to share with you all this book, called The Shack by William Young. It is a great fictional story about a father and a weekend encounter with God. The father's daughter is kidnapped and murdered (this is a very little part of the book and does go into details--it is not gruesome). A few years later he receives a note in his mailbox inviting him back to the shack where his daughter was killed. There he meets God as three persons--Papa, Jesus, and the Spirit. It really shows how relational God is and how much He wants to be in relationship with us. It helped me on many levels. It helped me with the why questions I have had since our baby boy died of a heart defect. It helped me with parenting and with just seeing God's heart. It is an easy read. My husband, who is not a reader, has not been able to put it down. I highly recommend it. You can go to http://www.theshackbook.com/ to find out more about the book. Now, I did want to leave you with one creation. 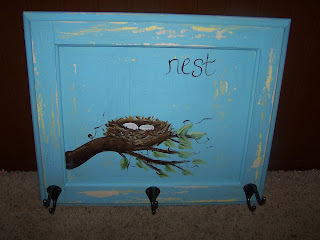 I wish I could take credit for this idea, but as many of you know, it came from Sharon S. on the HGTV message boards. It is a doggy bed made from two chair backs. It was fun and easy to make and I plan on making more. Have a great weekend! I know many of you are on the HGTV trash to treasure board and know who Sharon is. Boy, the things she finds curbside amazes me. 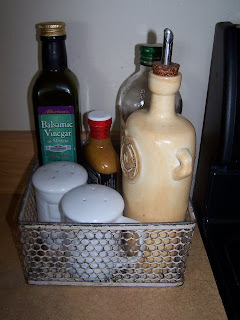 I rarely find anything in the trash and buy most of my things at garage sales and thrift stores. Our garbage company charges people extra if they have to physically get out of the truck and pick up something, so most people put it in the trash can and I never see it. But here are a few things I rescued from the curb. This table came from the side of the road. 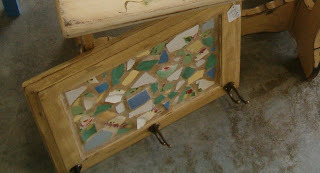 The top was very badly damaged so I did a mosaic on it, painted the table red and stained it. I stained the grout as well. 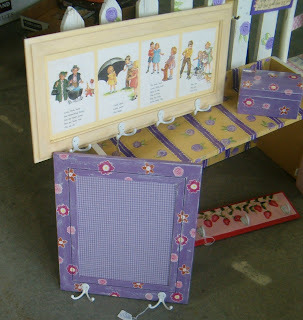 The chalkboard/magnetic board on top was made from a cupboard door. 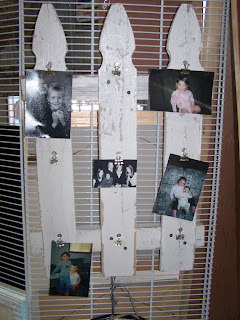 I will share many more cupboard door projects tomorrow. Sorry the picture seems a little fuzzy. This typewrite case was also found in the garbage. 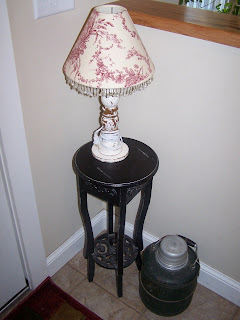 I painted it, decoupaged the top and screwed and glued it to a camp stool. 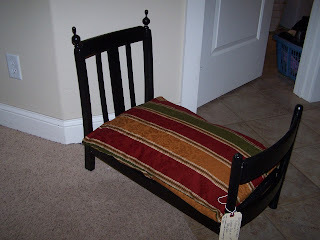 I made a little shelf across the bottom rungs of the camp stool to make it more stable and sturdy. I do drive the alley ways looking for old stuff and often find old wood, etc. Like I said in another post, I try to ask before I take something from an alley as I find many people are "storing" things back there. Plus, I don't want to end up in the police reports: Strange woman cited for stealing people's trash! I will continue to keep my eyes open for good trash (much to the embarrassment of my children) ! The kids were off of school today so the boys went snowboarding with dad, and my daughter and I went to see Horton Hears a Who. It was cute and has a good message, as the original book does, but honestly after 3 kids (my oldest is 15--so I have been at this awhile! ), I look forward to graduating from the animated movies. I remember taking my oldest to his first movie, The Lion King, and how special I thought it was and how neat it was to see an animated movie with my child. I guess the awe and wonder wore off for me! I prefer the non-animated kid's movies like Enchanted. I know, someday I will look back on it all and miss watching a good old Disney animated movie, but for now, I am ready for something else! I don't let on to my daughter that I don't enjoy the movies and it is special to spend one-on-one time with her. To get that, I guess I will suffer through the animation ( a collective boo-hoo will suffice Ü). Even though my boys hit the slopes, I do see ( and smell) little signs of spring here in Big Sky Country. The gophers are out in full swing and I can smell cow manure thawing and skunks that have been hit by cars. 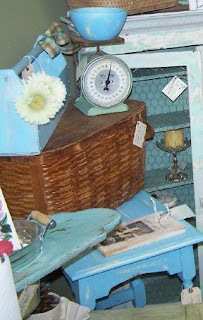 The blue color on these pieces that are in my antique booth get me in the spring mood too. 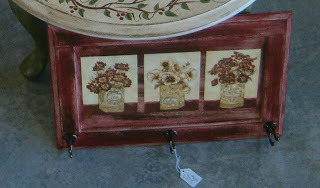 The tool carrier, the little table and the bowl on the scale were all painted with layers of different colors. I randomly rub a candle on each layer before painting the next layer on top. When it is all dry, I use a paint scraper to scrape the layers off. People seem to like it. The cabinet in the background already had the great green blue color on it. Today was the annual garage-a-rama indoor garage sale at the fairgrounds. I made it there almost before the doors opened. I had a couple of dear, but high-maintenance friends with me, who had to get coffee and cash before we could get there. I found some fairly good treasures. There are always those people who think they are selling at an antique fair and not a garage sale, but I did find some reasonably priced items. i got this little black table/plant stand, the aladin thermos, and lamp for $15. 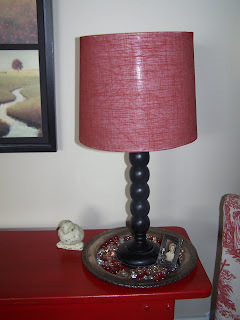 The funny thing is is that I made that lamp out of a porch post and sold it 6 years ago for $28. I bought it back for $4 and will sell it again. 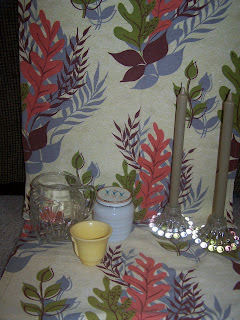 I got two pieces of this vintage bark cloth, the little glass pitcher (it is hard to see, but I love it! 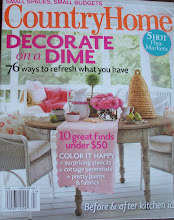 ), the beehive jar, and the candlesticks with the candles all for $10. 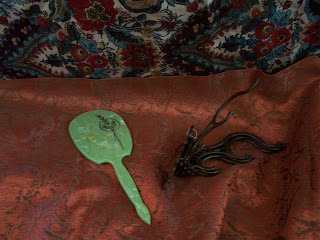 I got these two vintage pieces of fabric, the green mirror for my daughter's room, and the metal hook thing for $7. All in all, it was a good day. I also got a hutch and an awesome gate leg table that I will show you all another time. 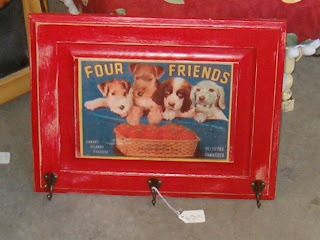 It was fun to be at "garage sales"--it's been a long winter and I have missed them. My girlfriends and I finished off our morning with a yummy breakfast at a downtown cafe. 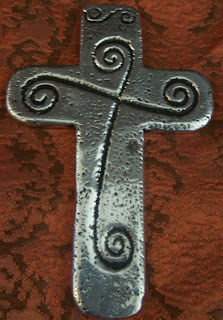 I found this pewter cross made in Mexico at Sally's. It was only 75 cents and since I had just seen several in Mexico for quite a bit more, I was pleased to find this one for so cheap. And on that note, I wish you all a Happy Easter. I pray that you are in the company of loved ones as you celebrate the resurrection of Jesus Christ! 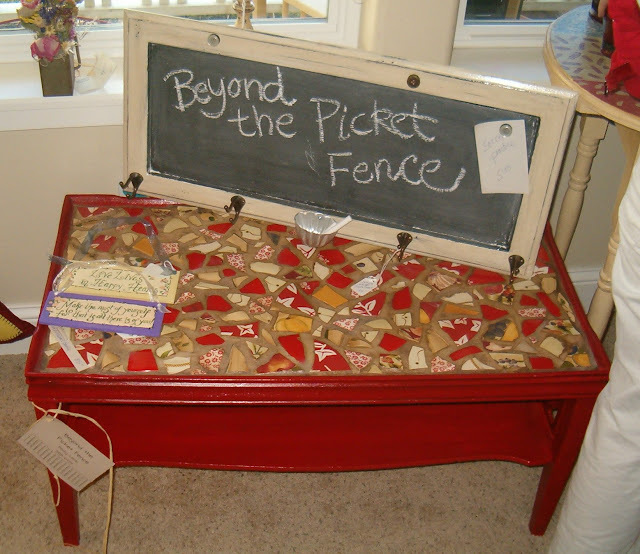 Since my business name is Beyond the Picket Fence, I like to make things using picket fence. I usually find sections of picket fence in alley ways. I always go to the door and ask if I can have it first. Here is a candle/flower holder I made. Very simple. I put rock salt in it and tea light candles in the winter months and fresh flowers in the summer. 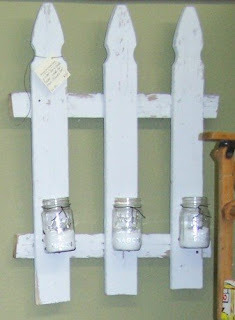 Here is a little shelf made from picket fencing. 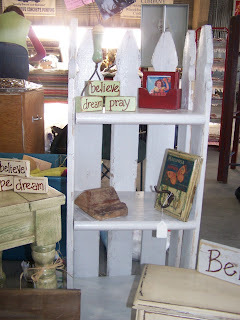 This photo display idea came from the junkmarket ladies. I think theirs was on a stand, but I just added picture hanging wire to the back. Sorry if this all looks a little scattered--not sure how to get my photos where I want them. Anyone have any advice? Happy Friday! Happy first day of spring! In Montana we were greeted in our usual way-- a fresh blanket of snow this morning. It was gone by the afternoon and the boys played football in shorts and t-shirts after school. It was however rather soggy for our egg hunt at preschool, but the kiddos didn't seem to mind! I wish sunny days ahead to all of you--especially those in Missouri and the other areas of the country that are getting flooded! 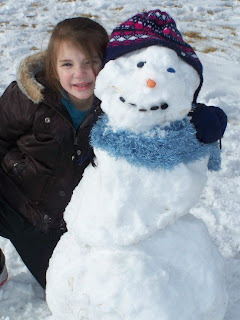 I set this blog up a while back but have been too chicken to actually write it. I guess I am worried I won't have enough to share. But, here I go--I am going to try it. Please be kind and gentle with me Ü--especially as I figure all of this out! I look forward to sharing my junk with you all. Ta-ta (I never say ta-ta in real life) for now.